The Wavebird Wireless Controller is a Nintendo GameCube Controller that sends inputs wirelessly to the console rather than through a cable like the standard controller. 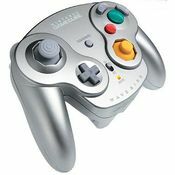 The Wavebird was first announced at SpaceWorld 2000 and was later released in 2002, and is the first Nintendo controller and the first first-party-produced controller overall to be completely wireless. The name "Wavebird" is a reference to dolphins, "Dolphin" being the development codename for the Nintendo GameCube system. The Wavebird Wireless Controller uses two AA batteries for power, and communicates with a Wireless Receiver (DOL-005) that plugs into one of the console's controller ports via a radio frequency signal of 900MHz (later models would use a 2.4GHz signal) when the controller is turned on; both the controller and the receiver can be tuned using the dials on the bottom sides of both. The official range of the controller is stated to be 20 feet by Nintendo. The Wavebird uses the same design and buttons as a standard Nintendo GameCube Controller, while adding an on/off switch, power indicator LED, and a space on the back to insert and remove the batteries, but lacks the built-in rumble feature of the standard controller. The Wavebird is also compatible with all Wii software that can use a Nintendo GameCube Controller by plugging the receiver into one of the system's four Nintendo GameCube Controller ports, though it is only compatible with launch Wii consoles, as the Wii Family Edition and Wii mini do not support Nintendo GameCube games or accessories. It is also compatible with the Wii U via the Nintendo GameCube Controller Adapter, and can be used to play Super Smash Bros. for Wii U. ↑ Operation of the Wavebird Controller. Nintendo. Retrieved June 8, 2015. This page was last edited on 22 November 2016, at 01:53.